Flowsheets are an essential part of any OB/GYN practice workflow. In an effort to improve practice efficiency and documentation, Elation recently introduced dynamic built-in prenatal flowsheets for OB/GYN doctors using Elation’s Clinical First EHR to make providing care for pregnant patients more streamlined. What sets Elation’s flowsheets apart? With built-in flowsheets, OB/GYN doctors can save precious time. To create a new flowsheet, simply go to the Clinical Profile on the left-hand side of the chart and click the “+ Add Flowsheet” button, as seen in the screenshot below. With this new feature, providers can more easily collaborate on the same flowsheet. Because staff members often times record weight, blood pressure, and urine, Elation has designed its prenatal flowsheets with those three vitals listed first. With this format, staff are able to record necessary vitals for individual OB visits. In addition, any provider at a practice can access Elation’s prenatal flowsheets through a patient’s Clinical Profile, so that multiple providers can contribute to a patient’s flowsheet. Pregnant patients need access to their flowsheet when they check-in to the hospital for delivery. Elation physicians have the option to either send the flowsheet to hospitals electronically via a Letter or eFax or print the flowsheet for a patient copy at anytime. 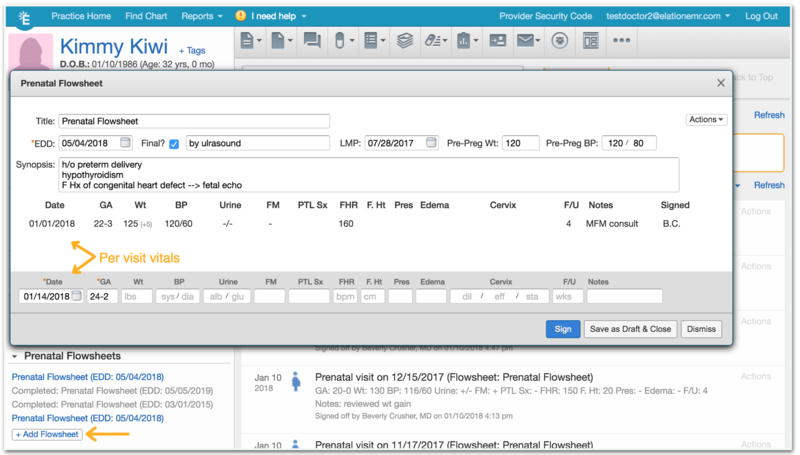 By using Elation’s prenatal flowsheets, OB/GYN independent physicians have the ability to keep track of patient information without sacrificing care quality. With greater efficiency, physicians have more time to spend with patients rather than documenting data. Contact us at usersuccess@elationhealth.com to let us know what you think about this new feature or to receive access if you are an OB/GYN physician.